Performance is a reference to the increasingly popular contemporary exploration of women's history. This determines a different view of the historical narrative and shifts the perception of history from being a collection of facts and dates towards the areas of oral history, legends and myths. What becomes important, are the questions about old customs, daily life and the seeking of one's own interpretation of history. The inspiration for the performance was the project ICHOT which involved the reconstruction of women's dresses from the time of the Polish Piast dynasty. My performance was a visual reflection on the place of women in the historical narrative and the perception of them in the social space, the transition from "the witch" to "the woman". 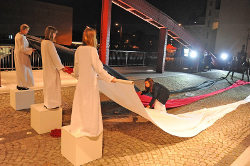 The performance was based on three colours symbolizing the three stages in a woman's life. The white colour indicating a virgin, red associated with motherhood and black reserved for a witch - an old woman. The Polish word for witch is "wiedźma" what means "a wise woman" or "a woman who knows". In today's society, only the first two life stages are appreciated, while the life stage of old women renders them "invisible". 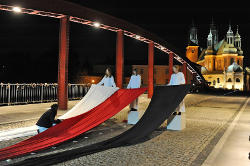 The white and red colours are also the colors of the Polish flag and black is used here to symbolize feminine wisdom – underappreciated or even an excluded element in the political framework, both today and in the past. I added the colour black also in reminiscence of the fact that once a woman’s old age took a completely different dimension and was the natural culmination and consequence of the two previous stages. 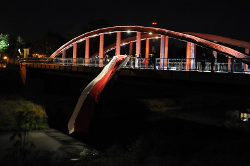 The performance took place after dark on The Jordan Bridge, also named The Bridge of Dobrawa. During the performance three women of different ages stood in white dresses on pedestals with the cathedral behind them. 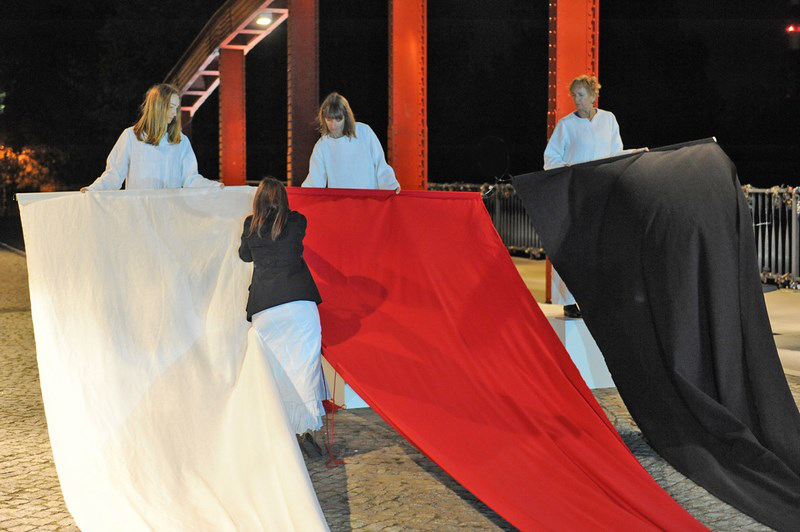 Each woman was holding fabric in the color symbolizing her life stage. During the action, I braided together a dozen meters of three pieces of fabric forming a tricolor flag. The audience were shaking rattles, instruments deterring evil forces. The curator was reading a kind of poem about the symbolism of Slavic Goddesses. 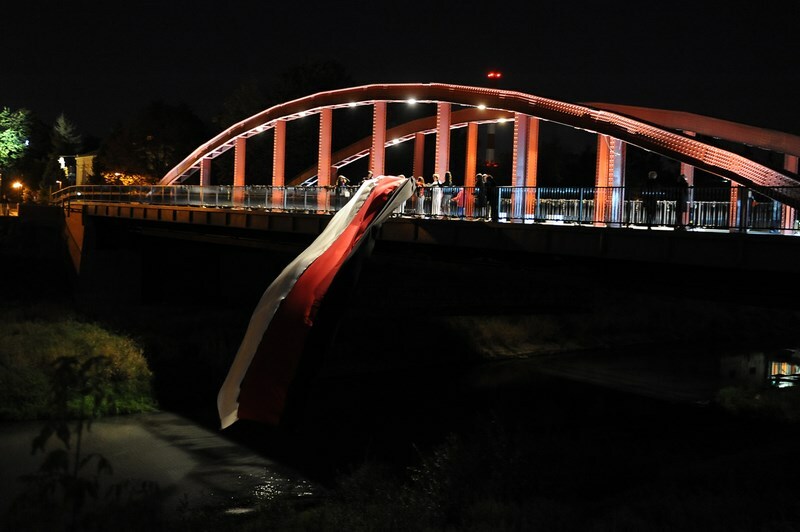 When the flag was ready, one of its ends was attached to the bridge and the other end was dipped in the river.